Homeless people exist in most urban areas; according to the United States Interagency Council on Homelessness, the state of California alone has roughly 134,000 homeless people in it––more than some countries (United States Interagency Council on Homelessness 2017). We don’t really like to think too much about them––we may give them a bit of our sympathy or maybe just look the other way––but they do exist, and they are indeed human, just like us. 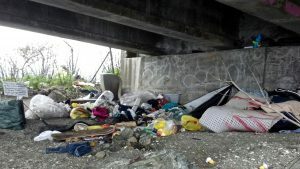 This image depicts a camp site scattered with essentials and valuables, which are frequently discarded as trash by city officials. “You develop coping mechanisms––a fight or flight response–– when you are homeless that are probably not appropriate in mainstream culture. You get increasingly defensive and desperate. This is just one of the many things that make it difficult for homeless people to re-enter normal society. We have to understand that a goal of creating more affordable housing units is not enough; we need a complete social safety net, including better treatment and counseling options, and plenty of compassion and understanding on the part of the community” (Indiana University–Purdue University Indianapolis 2008). While more affordable housing units is an excellent start to decreasing the rate of homelessness in cities, we need to actually understand the people we actively shun. While investigating the sites, Zimmerman and Welch discovered an abnormally large amount of hotel shampoo and conditioner, which was left unused. Why would people without a reliable access to water have a need for stolen hotel shampoo and conditioner? We also give them cans of food, but no can openers. This just shows an ignorance about homelessness; we give the homeless what we think they need, but not what they actually want or need. Some picture homeless people as uneducated, when in reality, many of them can and love to read. They also own many priceless objects, such as pictures of their family, or medications; these are frequently thrown out by city officials. Some consider themselves “home free,” as they are liberated from the confines of mortgages and rules. Though we think of them as “homeless” many actually consider themselves “home free,” as they are free of the constraints that come with a house. Perhaps this archaeology of homelessness could educate us about what the homeless are really like and what they really need. Charities and shelters could help them more than ever before; they now know not to waste money on cosmetic supplies and can now focus their efforts on essentials. 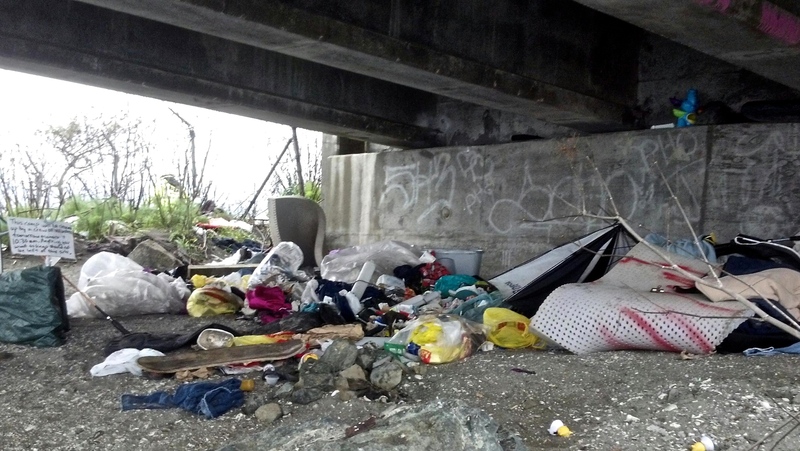 It is best to stop treating these homeless people like lepers––they are not invisible and they do not plague and pollute the streets of cities. 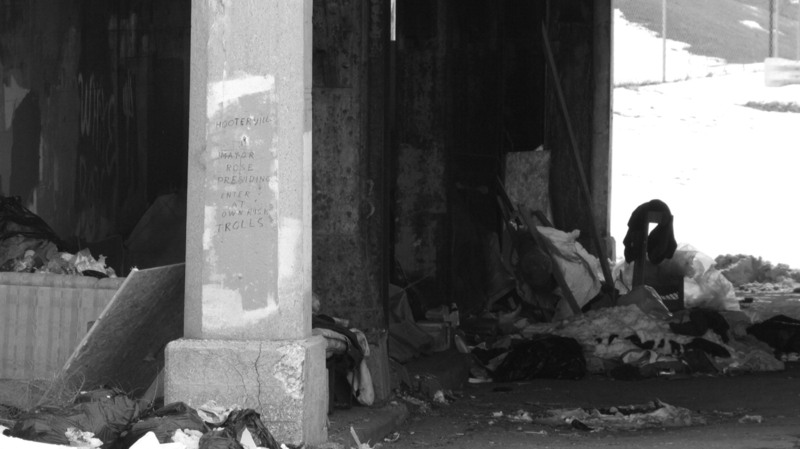 A homeless person is just like you or me: a person––a human being that is worth understanding. November 2009 Archaeology of the Homeless. Archaeology Volume 62 Number 6. Zimmerman, Larry J., Singleton, Courtney, and Welch, Jessica. August 2010 Activism and creating a translational archaeology of homelessness. World Archaeology Volume 42, 443-454. 2017 Homelessness Statistics by State https://www.usich.gov/tools-for-action/map/#fn=1500&fn=2900&fn=6100&fn=10100&fn=14100&all_types=true&year=2017&state=CA accessed December 2, 2018. This entry was posted in Fall 2015 by aharvin. Bookmark the permalink. Interesting blog post that really shows how archaeology can be used in social justice to help alleviate certain problems people face daily! So, I want to ask: do you think more archaeology should be like this, social justice in oriented? Or should it be more about research and finding knowledge? Or both? Good question! I think both aspects of archaeology are very important, and they also go along with one another. I think that research and finding knowledge is absolutely essential to social justice, and specific archaeological finds and artifacts can influence social justice in our society. For example, our society and our historical perspective is Eurocentric, meaning that we tend to focus on Europe and white civilization much more than others; but archaeology can correct this. The archaeological prominence of cities such as Angkor Wat challenges our eurocentrism, as we are forced to admit a magnificent civilization existed beyond Europe. But it can also tell us many things about our current state of cities: Angkor Wat grew until it was subjected to an onslaught of attacks, monsoons, and climate change (Lovgren 2017). This research could teach us valuable things about the state of our cities and society in general; perhaps that if we don’t change to things like climate change, we could end up similar to Angkor Wat. Research and finding knowledge is important to not only correct the “history” set in place, but can also show us the consequences of unwillingness to adapt to climate change. April 2017 Angkor Wat’s Collapse From Climate Change Has Lessons for Today. National Geographic. https://news.nationalgeographic.com/2017/04/angkor-wat-civilization-collapsed-floods-drought-climate-change/?user.testname=none accessed 14 December 2018.